A few years ago, I wrote a post discussing the curious intersection of music and puzzles. It centered around several studies about the effects both listening to music and performing music can have on individuals taking tests or solving puzzles. Both adults and children perform better on tests, puzzles, and problem-solving exercises when music is involved (ex. : if they listen to music before or during the test). Children who are given music lessons often achieve greater heights in other subjects, including math and sports. But it didn’t occur to me until much later that the connection between music and crosswords in particular has been in evidence for quite some time. 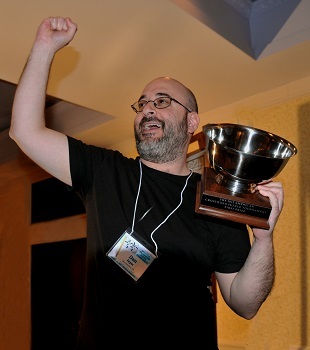 There are two 7-time champions in the history of the American Crossword Puzzle Tournament: Dan Feyer and Jon Delfin. Think about that. Fourteen out of forty-one ACPT tournaments have been won by one of these men. Practically one out of every three! And both of them have a musical background as pianists and music directors. But they’re not the only ones. Constructor Patrick Blindauer, puzzler and actress Whitney Avalon, Lollapuzzoola co-founder Brian Cimmet, and even our own Director of Digital Games Fred Galpern are all musicians. So what’s the connection between music and crossword puzzles? No one can say for sure, but there are theories. Their ability to assimilate a lot of coded information instantly. In other words, a piano player like John Delfin, the greatest crossword player of our time, he sits down and he sees three staffs of music and he can instantly play it. He’s taken all those notes and absorbs what they mean, instantaneously. If you have that kind of mind, and you add it to it a wide range of information, and you can spell, you’d be a really great crossword puzzler. In an interview with the New York Times, Dan Feyer built on this idea, stating that music, math, and puzzles all have pattern recognition in common, quickly recognizing combinations of blanks and spaces and mentally filling in possible answer words, even before reading the clues. Now, clearly, musical skill and proficiency isn’t required to be a good crossword solver — I’d classify myself as a pretty good solver and I have an almost magical lack of musical talent — but it’s intriguing to ponder how puzzling could easily be wrapped up with a musical bow. Do you know any other puzzlers with a musical background, or are you a lyrical solver yourself? Let us know in the comments section below! We’d love to hear from you!